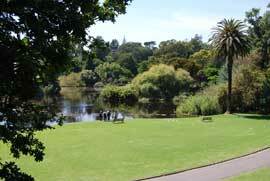 The Royal Botanic Gardens must be one of the best value free attractions in Melbourne. It's almost 90 acres in size with over 50,000 plants and has a reputation as one of the world's finest gardens. .........It's almost like being back in England!! I went on the free summer walk and couldn't recommend it highly enough. The guide is a volunteer so obviously has a love of the gardens and plants. This came shining through in his talk, along with the sun which made a nice change from the winter rain this year. I gather the lakes haven't been so full for over 10 years! I'm not sure how busy the walks normally get but there was only one other person on my walk which was a bonus. The tour actually took 15 minutes longer than the planned hour and a half and the guide made no show of wanting to hurry it along which was nice. The Children's Garden is just fantastic. You may want to avoid it in the busy holiday periods though - the best time to visit this garden is during term times - it's much more relaxing. 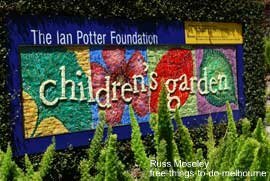 Have a look at Children's Garden to find what's available here. Also note that entry times are very different than for the Royal Botanic Gardens - we turned up about four times before we found it open - so be careful! The Herbarium has information boards outside on a self-guided little walk explaining about the herbarium and plants. 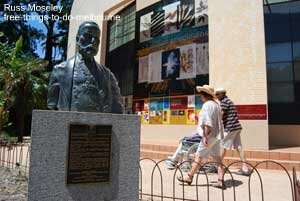 It's located close to the visitor centre. Don't miss Plant Craft Cottage if you have an interest in crafts or architecture or both. It was built in 1850/51 so is one of Melbourne's older buildings. It's open 10am-3pm weekdays and every third Sunday and you can see displays of fine craft including papermaking, basketry and other items made using natural fibres and plant dyes. They also do free Demonstration Days periodically. Check out the Plant Craft Cottage page which has the details. The cottage is located at the north-west corner of the Royal Botanic Gardens close to Lych Gate. The official address of the Royal Botanic Gardens is Birdwood Avenue, South Yarra but there are lots of entrances. Check out the map below for it's location. Opening times are 7.30am till sunset every day of the year.